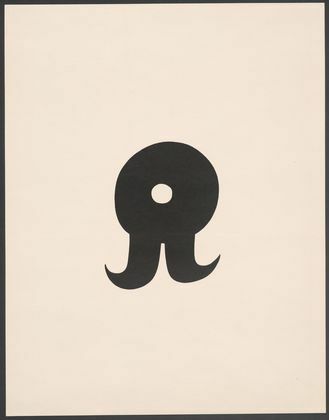 Jean (Hans) Arp, Schnurruhr (Mustache Watch) - plate 5 from Arpaden, 1923. Publisher: Merzverlag (Kurt Schwitters), Hannover, Germany. Edition: 50. Gift of J. B. Neumann. In 1923, while visiting Kurt Schwitters in Hannover, Hans Arp created a portfolio of seven lithographs of "object pictures." Titled Arpaden, a made-up word meaning “Arp things,” the simple graphic images combining body parts with everyday things can be seen as expressing a personal language of forms and symbols. Curator, Anne Umland: Arp, like Schwitters, was a poet, but in the interplay between the verbal and the visual, a slippage between the two is perhaps nowhere better seen than in this series of seven Arpaden, published in 1923. Each one of these seven boldly graphic images came with a very particular title. Moving along the wall you can see the first one's title is Mustache Hat. Then as you move through the series there are different forms: Navel Bottle, Mustache Watch, Egg Beater, Arabic Eight. All of the titles and shapes themselves are purposefully open-ended to provoke as many associations as possible. There's a fabulous fairytale-like narrative that might emerge from these different bold, graphic, yet elliptical forms arrayed before us.